This is the burgee of Carmel Sailing Club of Haifa, Israel. During a visit to Akko (Acre) I spotted the burgee of the Sea Officers School in Akko. Bet ha'Sefer le'Ktzine Yam (Sea Officers School), is named after 23 Haganah sailors who perished during World War Two under command of the British Navy in a mission to sabotage enemy ships. The burgee is a white emblem on blue. The emblem is a leaned anchor with seven Magen-David-like stars. The emblem can be seen at their website. 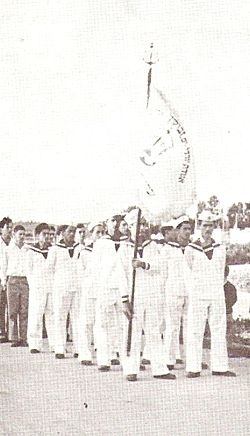 The other maritime school in Israel (Mevo'ot Yam in Mikhmoret, north of Netanya) probably uses a blue emblem on white as can be seen at their website. Agudat Yorde-Yam Zevulun, was the first Hebrew body in the modern era that targeted maritime education as its goal. It was founded in 1928 in Tel -Aviv (officially registered in 1930) and operated "Zebulun maritime school". It was in charge of training sailors (officially for the merchant marine but also crewmen for the illegal immigration ships). Today it is a sailing club with ten branches. There are two flags reported for Zebulun (at least in the Mandate era). The first one is the Zionist flag with the Magen David replaced with Zebulun emblem. Photo of a boat with this flag at wikipedia. The second is a white flag with the emblem and inscription above it.